The vastly improved capabilities of the Karl G. Jansky Very Large Array (JVLA) offer correspondingly exciting new opportunities for radio observations of novae. The JVLA nova team represents a multi-national, multi-wavelength partnership aimed at qualitatively advancing our understanding of nova mass loss. In addition to obtaining detailed radio light curves for bright novae visible to the JVLA (declination >-35 degrees), we have approved proposals for radio imaging (eMERLIN), submillimeter observations (SMA), X-ray photometry and spectroscopy (XMM, Swift, Chandra), and high-resolution optical spectroscopy (TRES on FLWO 1.5m). These data are interpreted via both analytic and numerical models, which we are actively enhancing as the data demand. This and most other nova work rely heavily on the enthusiastic support of the amateur community, particularly under the auspices of the wonderful American Association of Variable Star Observers (AAVSO). to challenge and extend current models of novae by confronting them with the widest possible range of consistent, high-quality, multi-wavelength observations. Nova Sgr 2012 was first observed with the JVLA two days after the optical discovery, on 2012 Apr 23 = MJD 56040, at 32 GHz. A preliminary reductions gives a non-detection with a nominal flux density of 32 +/- 25 microJy/beam at the position of the source. Nova Oph 2012 was first observed with the JVLA on 2012 Apr 23 = MJD 56040, at 32 GHz. A preliminary reductions gives a non-detection with a nominal flux density of -13 +/- 32 microJy/beam at the position of the source. The recurrent nova T Pyx went into an unexpected outburst on 14 April 2011, and the JVLA Nova Team has initiated a monitoring campaign with the JVLA. We have made the first radio detection of T Pyx , and it has now brightened significantly. We estimate that the nova eruption began on MJD 55665.0 (Schaefer et al. 2011); the data are plotted relative to this time. The JVLA Nova Team has been monitoring V1723 Aql since 25 September 2010, around two weeks after the initial optical discovery. Below, we plot spectra as well as lightcurves. We will update these plots as new data are acquired. Also, check out our paper on V1723 Aql , published in the JVLA special issue of ApJ Letters. Note that the nova eruption was observed to begin on MJD 55450.5 (IAUC 9167); the data are plotted relative to this time. 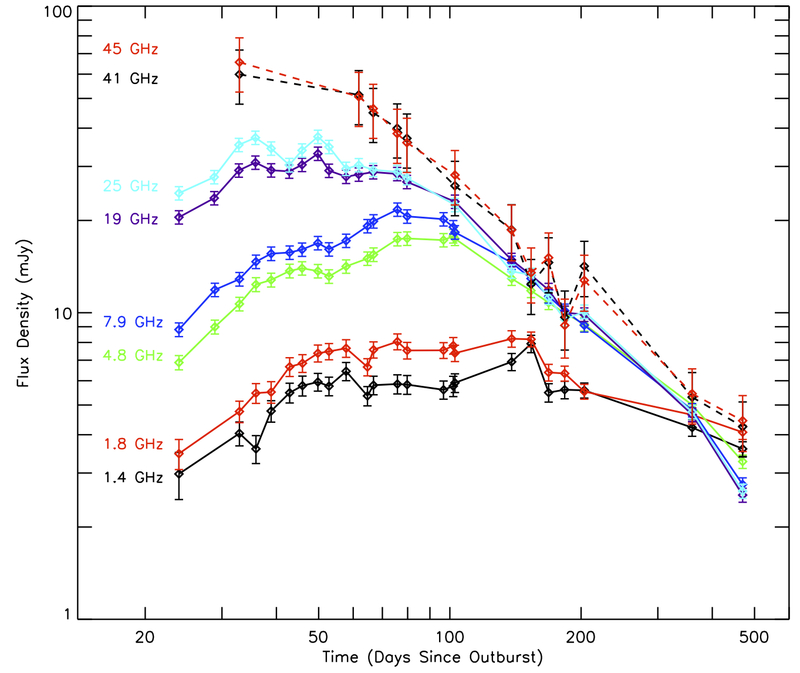 The JVLA Nova Team has been monitoring V407 Cyg since 3 April 2010, around three weeks after the system erupted. 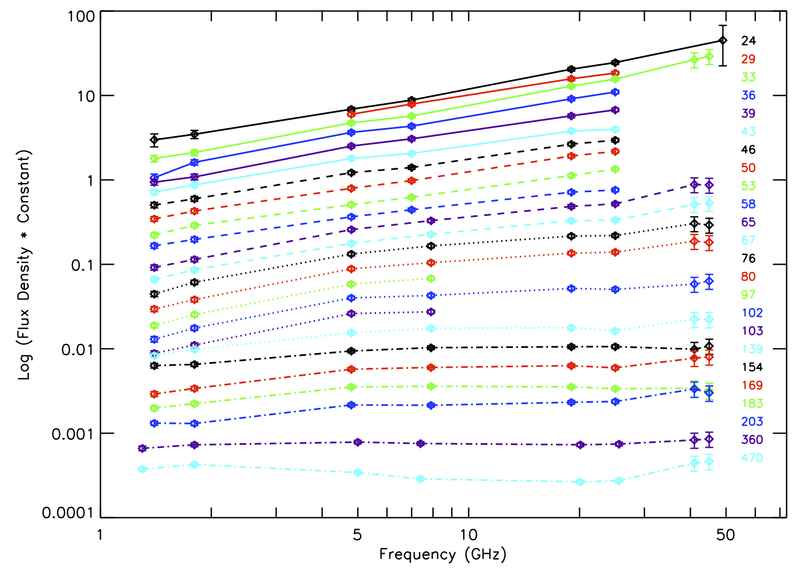 For most monitoring epochs, we have frequency coverage from 1.5 - 45 GHz. Below are the radio light curves and spectra, updated as we acquire new data. Note that the nova eruption was observed to begin on MJD 55265.8 (CBET 2199); the data are plotted relative to this time. We have begun an investigation of the recent classical nova V1312 Sco ( discovered 1 June 2011). 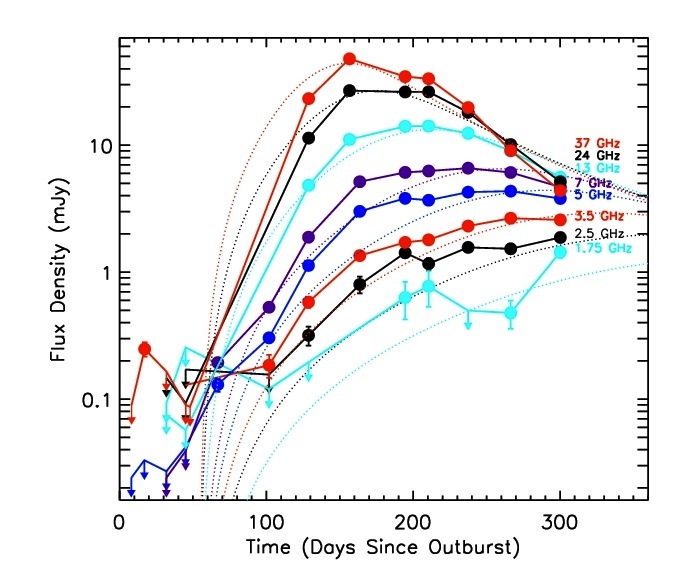 Our first observations took place just 11 days after discovery, but all of our observations yielded non-detections, consistent with a distant (> 10 kpc) nova. We observed the classical nova V5588 Sgr, which showed an interesting quadruple-peaked optical light curve. Our JVLA observations began on 21 April 2011 (25 days after the initial discovery on MJD 55647.9, and around the time of the start of the secondary rise), and are described in a series of ATels ( #3319, #3397, #3539). Essentially, V5588 Sgr emits unsteadily, brightening and fading by factors of several on timescales of weeks. The detections on May 14/15 and June 15 are roughly coincident with peaks in the light curve, perhaps hinting that that the maxima are related to shocks, either internal to the ejecta or with surrounding material. We can estimate a lower limit on the distance using the 33 GHz non-detection on June 2.3, and assuming that the radio emission is due to optically-thick thermal emission from a 10^4 K sphere expanding at 900 km/s (IAUC #9203). We find that V5588 Sgr is quite distant (>9 kpc; likely associated with the Galactic center), and therefore have ceased JVLA monitoring. "We observed the nova V5587 Sgr (CBET 2644, IAUC 9196 ) with the JVLA on three dates ranging from 8 to 40 days after discovery (2011 Jan 25.9); all observations yielded non-detections. 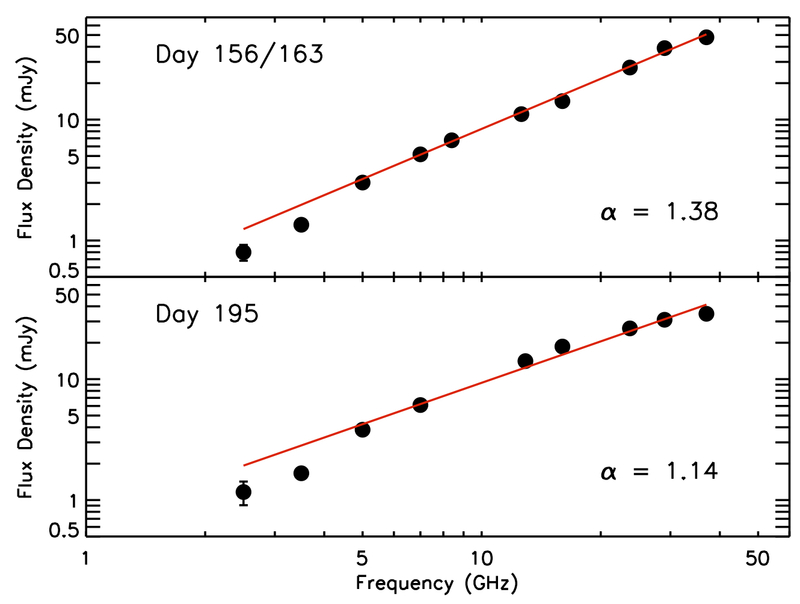 Below are the UT dates, flux density measurements with 1-sigma uncertainties, and lower limits on the distance. The distance limits derive from the assumption that the radio emission is thermal free-free emission from an optically thick expanding sphere with a temperature of 10^4 K and a radius that increases at a rate of 1650 km/s." You may contact mkrauss at nrao.edu with any questions or suggestions.